If you can see under my belly, I proudly wear a Montana Silversmiths buckle on my belt. It’s classy. It’s pretty. It’s rodeo. There are a lot of people who wear a Montana Silversmiths buckle, some of which are golden. 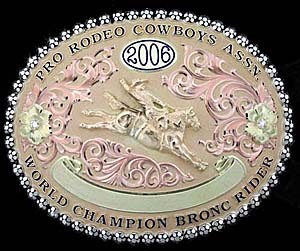 In fact, any person crowned ProRodeo world champion since 2000 wears a gold buckle made by Montana Silversmiths, so there are a lot of them. For 11 years, Montana Silversmiths been the official buckle sponsor of the Professional Rodeo Cowboys Association, making Montana Silversmiths the longest running buckle sponsor ever. So what buckle company had the buckle sponsorship right before Montana Silversmiths, and how many years did that company have the sponsorship? The only one I Remember is Hesston Corp. We used to get a buckle every year for Christmas. Award Design. WAY too long. Mr. Norton might know the quality — or lack thereof — better than most, because he won his world championship in the Wrangler Bullfights before Montana Silversmiths signed on. And while he’ll argue that he’s 100 percent right, his choice of Award Design Metals is just half the answer. Now it’s just a numbers game. Congratulations, Jerry, on getting the question half correct and on a fabulous, ongoing career that saw him inducted into the Casey Tibbs South Dakota Rodeo Hall of Champions this year. Hesston was a longtime sponsor of the National Finals Rodeo and still makes a commemorative buckle. I’ve got a bunch of ’em. That’s a great guess, Dawn, but I’m afraid you’re incorrect.